The appeal of board games for most of us is to be able to sit around a table, get out a game and play. This is how I play a lot of my games – 2 player with my partner, with a group of friends in a house, or at a games club. Indeed the seems to be a lot more games clubs out now than 10 or 20 years ago, so even if your family and friends don’t share your passion for board games there are plenty of places to find new friends that do (not suggesting you need to jettison your existing friends 😆 ). 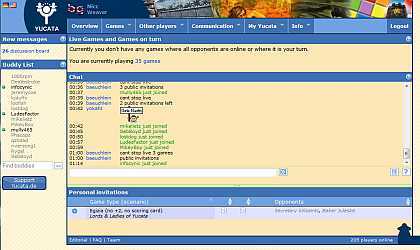 However there may be times when you want to play a game but unable to set up a face-to-face meeting, to scratch that itch we have online board game sites. There are several websites that offer the ability to play a variety of boardgames, some concentrate on real-time play (where you all play the game in a single session), asynchronous PBEM (you are notified by email when its your turn), or a combination of these. For this post I’m going to look at Yucata.de which I discovered only a month ago. Yucata is a German based website offering, so far, eighty different game titles with more in the pipeline. There are well known games such as Carcassonne H&G, Roll Through the Ages, and Stone Age, as well as lesser known games. There are some that are now Out Of Print that are eagerly snapped up at a premium price when copies are put up for sale, so online may be the only place to play them. The site is intuitive to use and easy to navigate and most of the titles use authentic graphics adding to the appeal. You can set up invitational games, where you specify a list of friends to invite, or public ones that have an open invite to anyone – they have a page listing the open invite so you can join in on a game set up by others. A nice feature of the invitational option is you can invite more people than the game can play, so for instance if you have a list of twenty friends, you could invite them all to a 4 player game and the first three that accept will join you in the game. The games tend to be played over several days as you will find most people will be in dozens of games and taking turns as they arise. This is not to say people don’t play in a single session and you will see open invitational games with the note “live game” or something similar. I’m finding the site quite addictive. For the most part the ability to dip in and out is great as I can grab ten minutes every so often and play some turns on a bunch of games – a great way to break up whatever tasks you are doing in real life, and in the evening I’ll leave it on in the background diving in when the message pops up saying its my turn on some games. 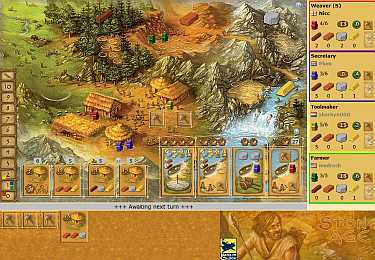 I’m taking part in some tournaments of with players in a BoardGameGeek guild including one for Stone Age that’s seven games simultaneously as half of the first stage (so trying to remember what strategy you are using for each is interesting). I am also learning new games, its a great teaching tool, so that I can then teach others when playing physical versions face-to-face.